This stretch of the A844 at Kingarth is among the roads on Bute set to be improved by Argyll and Bute Council during 2015-16. More than £400,000 is to be spent improving roads on Bute in the course of the new financial year. * £17,903 on preparation and surface dressing of Westlands Road in Rothesay, from the former Knockanreoch farm to Abercorn. The provisional budget allocation for roads improvements across Argyll and Bute in the next 12 months is £4.366 million, to be split as follows: £453,500 in Mid Argyll; £450,000 in Kintyre; £452,750 on Islay and Jura; £830,000 in Oban and Lorn; £700,000 on Mull; £419,004 on Bute; £452,731 in Cowal; £610,002 in Helensburgh and Lomond. 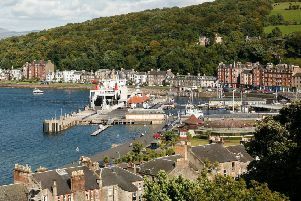 A report on the subject, to be put before the council’s Bute and Cowal area committee, which meets in Rothesay on Tuesday, April 7, states: “Schemes are not necessarily directed at what could be considered as ‘roads in a poor condition’. “Surface dressing schemes are selected on the basis that either the skid resistance of the road surface is poor, or the road surface requires sealing before it fails.